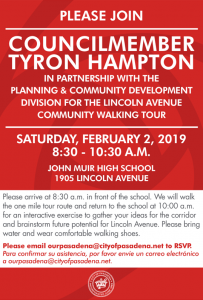 Please join Councilmember Tyron Hampton in partnership with the Planning and Community Development Division for the Lincoln Avenue Community Walking Tour. Participate in a one mile walking tour of Lincoln Avenue followed by an interactive exercise to collaboratively brainstorm future potential of Lincoln Avenue. We are planning to walk rain or shine, so please wear comfortable shoes and bring an umbrella.